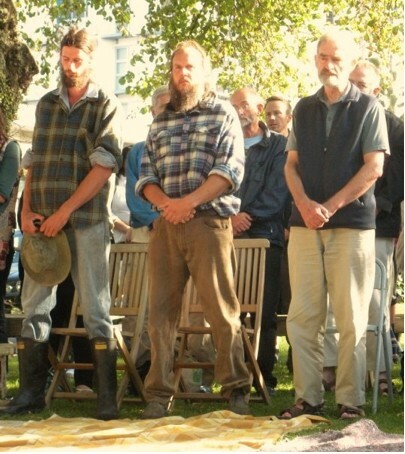 The jury trial of three Ploughshares peace activists, Adrian (Adi) Leason, Peter Murnane and Sam Land is being held in Wellington, New Zealand this week. People are coming from around New Zealand and Australia to support them and to give voice to the issue behind their trial—the need to close the Waihopai Spy Base and end New Zealand’s links with the US war machine. Waihopai is New Zealand’s most important contribution to that war machine, far more so than any Special Air Service presence in Afghanistan, and has been operating as an outpost of US intelligence 24/7. Lets rewind, to 6 a.m. the morning of the April 30, 2008. 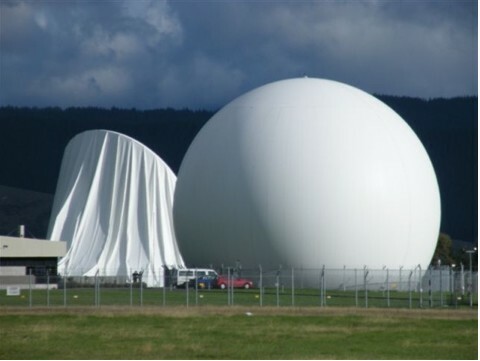 Adrian, Peter and Sam have entered the Waihopai Spy Base in Blenheim, New Zealand, and used a sickle to deflate one of the two 30 meter domes covering satellite interception dishes. The group then build a shrine and pray for the victims of the war with no end—the so-called “War on Terror” led by the United States, a war that has resulted in illegal military invasions, illegal detention and torture and an unprecedented attack on civil liberties in all Western democracies. “They shall beat their swords into ploughshares, their spears into sickles; nation shall not lift sword against nation; and there shall be no more training for war” (Isaiah 2:4). Ploughshares is not an organization or even an organized movement—it is simply a name invoked by different groups of people who are committed to peace and disarmament and who nonviolently, safely, openly and accountably disable a war machine or system so that it can no longer harm people. Ploughshares actions started in 1980 in the US and have taken place in many different countries with weapons as diverse as rifles, warships, missiles, submarines and aircraft being dismantled or damaged. Most people involved with Ploughshares actions would say they are people of faith and followers of Jesus, but supporters come from a wide range of backgrounds and worldviews. The ECHELON spy network, including Waihopai, is an important part of the US government’s global spy network. Despite New Zealand’s opposition to the US-led invasion of Iraq, Waihopai is funded by New Zealand taxpayers and its activities are shrouded in secrecy. All that is needed for Waihopai’s continued operation and our subsequent complicity to the “War on Terror” is our silence. Since this action hundreds of people have been asking to join the list of Ploughshares supporters. While personal, prayerful, logistical and financial support for Ploughshares is essential and encouraged, the three individuals involved have expressed hope that many others are inspired to undertake even more creative and courageous actions in Aotearoa New Zealand, and across the world. If you wish to know how to support the Waihopai Ploughshares, there are some ideas on their website. For up-to-date information on the trial as it unfolds this week, check out Bryan Law’s blog. And for a concise description of the issues surrounding Waihopai check out the Anti-Bases Campaign website, as well as this extensive statement by Waihopai researcher Nicky Hager. Kia tau te rangimarie ki a tatou katoa (peace alight upon us all). Will Watterson is an accidental activist with faith-centered leanings towards eco-communalism and nonviolent direct action. He currently resides in Wellington New Zealand, where he works as an education officer for Global Focus Aotearoa, running workshops and events with social justice themes. He also co-manages a youth activism website called Just Focus. His rants about faith, social justice and rediscovering community can be found on his blog No Such Thing As Silence. What’s wrong with being the world’s most peaceful country?